A group of thieves made up of two ex-special forces soldiers, Michael (Chiwetel Ejiofor) and Russell (Norman Reedus), Russell's druggie brother Gabe (Aaron Paul), and two dirty cops, Marcus (Anthony Mackie) and Franco (Clifton Collins Jr.), are hired by Russian Mafia head Irina Vlaslov (Kate Winslet), to steal some documents from a Federal evidence building that can get her husband out of a Russian Gulag. In order to complete this task, they need to distract the police force by creating a situation that will draw all other cops away from their location. They decide a 999, the police code for "officer down," is the best option. Their target is Marcus' straight-laced partner Chris (Casey Affleck), who just wants to do his job and make a difference on the force. All of the actors already mentioned, plus Woody Harrelson, Gal Gadot, Teresa Palmer, and Michael Kenneth Williams. Have you heard of or seen a better cast??! "Triple 9" is a gritty crime thriller that takes a look at the grimy underbelly of Atlanta, Georgia, and the criminal elements that operate there. Director John Hillcoat tells this story in a somewhat unconventional manner as there are no clear lines drawn separating protagonist and antagonist for the audience. Knowing this fact alone, it will isolate a lot of potential audience members because it seems if there's not a clear-cut hero and villain within a story, people automatically shy away from anything without this linear formula. The film is often fast paced with a lot of information being offered in short amount of time. Again, the second instance of instant audience isolation. We learn about each character and their role in these crimes rather quickly, and the film starts in the middle of a pre-planned bank heist. Three strikes and they're out. Chiwetel Ejiofor plays Michael, an ex-special forces soldier who has been doing jobs for Irina Vlaslov, played by Kate Winslet, who is the acting head of a Jewish Russian mob. Irina is trying to obtain documents to get her husband out of a Russian Gulag, and these documents happen to be going to a Homeland Security office in Atlanta. Michael is also Irina's sister's one-time lover and the father of Irina's nephew. On Michael's crew is his best friend and fellow soldier Russell, played by fan favorite Norman Reedus, and Russell's screw-up brother Gabe, played by Aaron Paul. Also on the team are two dirty cops named Marcus, played by Anthony Mackie, and Franco, played by Clifton Collins, Jr. This team must infiltrate the Homeland Security building during the day the documents are being temporarily housed there, and to pull this off, they plan on pulling a 999, which means they will have to kill an officer to do it. The officer they are intending to target is Chris, played by Casey Affleck, who was just transferred in and partnered with Marcus. Chris is a good cop who just wants to do his job and make a difference. Then, there's Chris's uncle Jeffrey, played by Woody Harrelson, who is investigating the robbery from the beginning of the film, but has a lot of personal demons to deal with on his own. From here, the plan begins to fall apart as quickly as it was conceived. Some might call this a heist movie, but often in heist films, the thieves are somewhat seen as anti-heroes, people the audience will be rooting for to pull off a job successfully. This is not the case here. The movie makes it clear those perpetrating the crimes are not good people, and success for them leads to many terrible things. Like we mentioned, there are a lot of elements and moving parts to this story, and there is a lot to be missed if one isn't paying strict attention. There isn't big focus on one individual character, but rather a much smaller focus on several characters and what is happening to them during this series of events. The heists, what is being stolen, how they will do it, and what will happen isn't nearly important as the surrounding situations and the interactions between characters. We've heard some viewers claim there are unnecessary characters or scenes, which we believe couldn't be farther from the truth. Every scene that happens is necessary as is every character no matter how briefly they may appear. The characters, to us, are well developed, though deeply flawed as none of them are the type that will relate directly to the audience. Sometimes in life, there are no real heroes, and sometimes when there are, your heroes are not as clean as we like them to be. 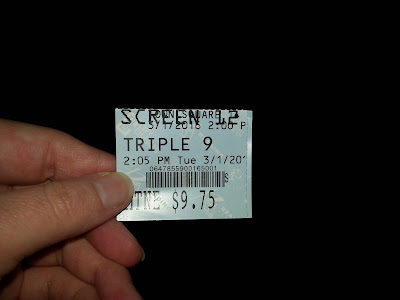 "Triple 9" is tension-filled, kept us engaged, and had us on the edge of our seats nearly the entire film. However, there are a few lulls here and there, but these brief periods of time don't make the movie any less interesting. Upon reading other reviews, we're not quite sure we saw the same film as other people. Most other critics found this movie to be a flawed mess of squandered potential, but we don't see it that way at all. 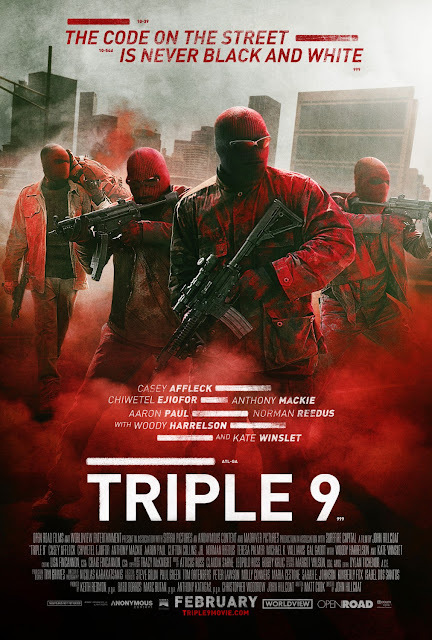 Those going into "Triple 9" thinking it is a simple heist movie may be disappointed because this one actually requires you to pay some semblance of attention. One year ago, we were watching: "Leaving Las Vegas"